"Right now, everyone on Schitt's Creek is my family — kind of more than family," she tells The Advocate. 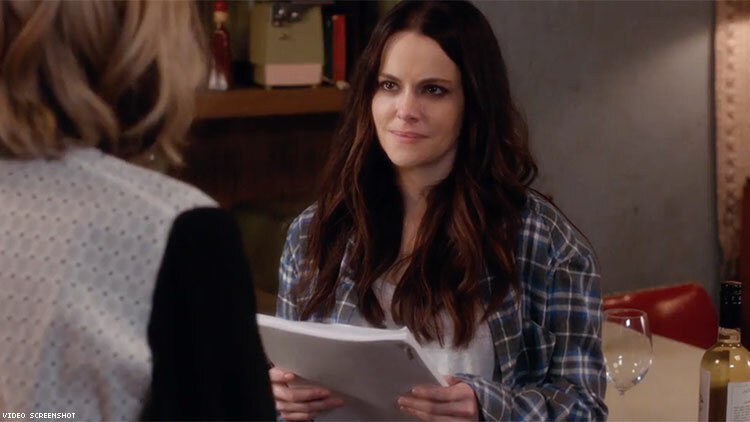 It's the week of the Schitt's Creek season finale, and no one is more emotional about it than Emily Hampshire, who may have just given us the most tear-jerking moment of the entire series. "As much as we've noticed the letters we get about how it affects fans, it's done the same for us," she told The Advocate over the phone, on her day off from filming the sixth and final season in Toronto. "Speaking for myself, this show has changed my life — not just in terms of getting a job that pays and being on a TV show, but my life has just opened my heart in ways I didn't think existed." In this comedy about an eccentric, formerly-wealthy family who end up stranded in a small town after losing their fortune, Hampshire plays Stevie Budd, reluctant owner of the run-down motel where they live. Over the past five seasons, Stevie has grown close to them, partnering with patriarch Johnny Rose (Eugene Levy) to run the motel and becoming best friends with his son David (Daniel Levy), who is just as sarcastic and generally bad at emotions as she is. This season, former soap opera star Moira Rose (Catherine O'Hara) puts together a production of Cabaret for the community theater. She gives the lead role of Sally Bowles to Stevie, who has never acted before, recognizing Stevie's potential even when she's at her lowest point after a failed relationship. In almost any other comedy, the finale with Cabaret's opening night would be an adorable disaster, the kind of thing you watch through your fingers. But this is Schitt's Creek, so the production pulls together into something sincere and brilliant at the exact moment you've let your guard down. The high point is Stevie singing "Maybe This Time," her anxiety giving way to a triumphant, joyful performance. Hampshire said playing Bowles has been a lifelong dream of hers, and something she never imagined she'd get to do on Schitt's Creek, despite begging Daniel Levy (also showrunner and co-creator of the series) for a musical episode while they were filming the first season. "To do it as Stevie was even better than I could have asked for. I'm not a singer or a dancer, my Broadway dreams are ridiculous. But to get to do it as Stevie, I got to really be forgiven for any of that stuff." More importantly, "As a performer, a lot of times you [get to] say your true feelings through some other character, so you don’t have to admit them or take responsibility for them, and you can kind of be freer in that way than you can in life. For Stevie, she's so closed off all the time and doesn't want to express anything real, and I wanted to hopefully let her have a real authentic moment through that song." Stevie's story arc during this season has been particularly important to queer viewers, and not just for Broadway-related reasons. Although she identifies as straight ("I only drink red wine," she explains in that clever pansexuality metaphor from Season 1), there is something in her character that the community latched onto immediately — the sarcastic misfit with an endless supply of flannel shirts, afraid of being trapped in a lonely small town, capable of a surprising, intense sort of love that she hasn't figured out what to do with yet. We know that girl; we've been that girl. So even as Schitt's Creek fans cheered for David's heartwarming romance with his business partner Patrick (Noah Reid) and their engagement in last week's episode, they've worried about how Stevie's difficult season might end. Hampshire admitted that she couldn't stop crying the first time the cast read through the finale together. "The crying started the minute David told Stevie he was engaged. I have a big place in my heart for Stevie, and I just felt that thing where you're so happy for your friend, you want to be happy for them, but you're left behind. I couldn't keep it together." It's Moira who puts this fear to rest while giving Stevie a backstage pep talk just before her big solo, admiring her for standing her ground and refusing to be anything but herself. "Never thought I'd say this about anyone in this town, but you… you're very, very cool. And whether you set sail or stay put, that's not going to change." "She's a better mother to Stevie in that moment than she is to her children their entire lives," Hampshire said, "because she's encouraging her and being proud of her and telling her all these things you kind of want from your mother. Mr. Rose and Moira are better parents and David is a better brother to Stevie than they are to their own family. We realize in the end that the Roses love each other, but they won't show it to each other, whereas they really show it to Stevie." The idea of Stevie finding a family that loves and supports her is an important one for Hampshire, particularly as she's surrounded herself with artists and members of the LGBTQ community throughout her life. "I do relate to that on so many levels, because I've been an actor since I was 14, and I moved out when I was 16. When you're working as an actor when you're younger, or even when you're older, it's carney life. You go from one show to the other and you make these quick makeshift families. And they're real, during that period of time. Right now, everyone on Schitt's Creek is my family — and kind of more so than family, because you choose them." She credits Levy's storytelling over the course of the show for allowing Stevie to grow so much this season. "You couldn't have had Stevie have these kind of vulnerable emotional moments had it not been for four seasons past where she didn't show a thing and was closed off. I think it's such a testament to Dan how he is kind of methodically and slowly revealing these characters, peeling them back season by season, and doing it in such a smart and thoughtful way." She also praised his decision to stay true to the story and end Schitt's Creek after next season, his plan from early days of the show, even as it gets increasingly popular — not that she doesn't get choked up at the thought of it ending. "On the plane over here to start shooting, I was bawling my eyes out, and Teddy [Geiger] my fiancée came over like, 'What’s wrong?' I just had this burst of like, I'm so grateful that I had this experience, and I felt so bad that I never told Dan how grateful I am for Stevie and the show and what it's done for my life. I would never tell Dan sweet things — our relationship is kind of like Stevie and David where I'll be sarcastic with him and I'd never give him that kind of thing." So for all the people who love Stevie and want the best for her, what can we expect from Season 6? "She dies in a fire," Hampshire laughs. "There's a huge fire at the motel." Jokes aside, she assures us that Levy would not be ending the show if he didn't have a perfect final chapter that gives both the characters and the audience what they deserve. "It's going to be satisfying for every character, and I think, again, surprising. I'm constantly surprised when we get the storylines — like, wow, Stevie's doing this? And it's never just a show gimmick, it's always profound. "I think everyone is going to be sad that it ends, but grateful that it did in that way, and was done right by. So I think everybody will be happy for Stevie."